The Divine Expedition: Where Are You in the Book of Romans? is now available for purchase! The list price is $16.95—but we are offering it on our website for a limited time at $14.95 plus $4.95 for postage and packaging. Order 5 or more copies and we’ll throw in FREE shipping. + $4.95 shipping and handling. FREE SHIPPING FOR ORDERS OF 5 COPIES OR MORE! We are excited about being “on expedition” and hope you will join us in the greatest adventure of all time. In The Divine Expedition: Where Are You In The Book Of Romans?, Linus Sr. and Linus Jr., father and son, believe it is our God-given design to be on an expedition, and that the greatest adventure of all time is revealed in the Bible in the book of Romans. In it, we are invited to embark upon a Divine Expedition, leading far beyond where we could otherwise journey in life. The Divine Expedition unfolds a life-map to rescue us from spiritual deadness. Each chapter begins with stories from some of history’s great expeditions, illustrating the different elements of the Divine Expedition. The two Linuses also draw from their own personal experiences in seeking to live out the unfolding and sequential expedition revealed in Romans. Linus Morris Sr. is a Missional Catalyst and served for twenty-five years as President of Christian Associates International. He co-founded News Release Basketball and taught as adjunct professor at both Columbia International University and Bakke Graduate University. Linus Sr. and family have lived in five countries and participated in establishing a number of churches. 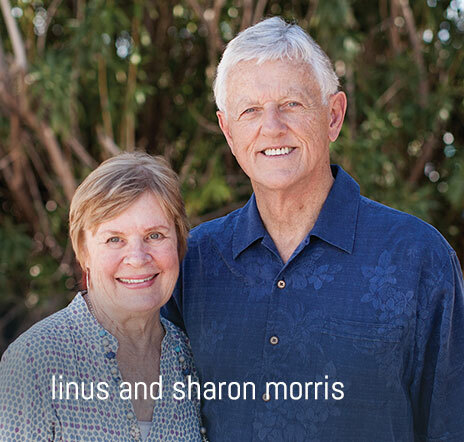 Linus and Sharon are parents to six children, including Linus Jr.
Linus Morris Jr. works with Adventures of the Heart, a ministry to help men experience true meaning and freedom by connecting with their hearts. He has embarked upon numerous adventures including surfing, kiteboarding, stand up paddle boarding, scuba diving, snow boarding, rock and mountain climbing, white-water rafting, and playing basketball abroad.